Do you suffer from arthritis? Are you in constant or regular pain in your joints? If you have an issue, it’s in the tissue! Have been told that there is nothing that can be done to eliminate the pain from arthritis? Rather than just treating the pain from arthritis, ensure that you treat the underlying issues and restore your mobility and health for the long term. 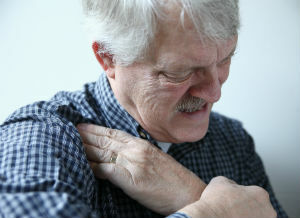 You do not have to live in constant pain as a result of arthritis. Ross Short has a proven program to address the route causes of your pain and reduce the suffering. At Body-Wize, our approach is to treat the whole body, eliminating pain for the long term rather than focusing on a short term fix or adjustment that will mask the symptoms. Helping you manage arthritis and achieve optimal health is Ross’ primary goal. There are over 100 different kinds of arthritis, but they are all disorders of the joints, characterized by long term pain. Ross uses four proven modalities to bring your tissue and body back into alignment and eliminate pain – Hellerwork Structural Integration, Pilates, Reiki, and Whole Body Vibration. Using this unique combination of techniques to address balance in the whole body, Ross has a 93% success rate in reducing or eliminating chronic pain in his clients. Whether you suffer from arthritis, or a condition such as tendonitis, neck pain, shoulder pain, tennis elbow or plantar fasciitis, Body-Wize can help eliminate the discomfort. At your first appointment, Ross will assess your alignment and balance and work with you to build a program to treat the cause of the pain. Body-Wize can reduce your immediate pain and create a plan that creates long term balance and health. Book your appointment with Ross today to ensure that you best manage the pain due to arthritis. By treating the underlying issues, you can return to ideal health and vitality.